Very little information is available about the early life of Yogaswami (1872 -1964), the famous mystic and spiritual master of Sri Lanka. His mother passed away when he was still an infant. Then he was sent to live with an uncle in Columbuthurai where most of his life was spent. He was raised in the Hindu faith by his aunt. The boy was first educated in a Tamil school and later in a Christian institution called St. Patrick's College where he was probably introduced to Christianity. Although at school he did not study beyond the seventh or eighth standard, he became proficient in Tamil and English. We know that he was employed as a storekeeper in the Irrigation Department at Kilinochi where he worked efficiently and punctiliously. His leisure was devoted to practising meditation and memorising hymns in Tamil and Sanskrit. Even later in life he loved reciting them with religious fervour. It is said that in 1897 the youthful Yogaswami attended a public meeting in Jaffna that was addressed by Swami Vivekananda, the celebrated exponent of Hinduism in the West. When Vivekananda, who had a busy schedule, began his talk by saying that "The time is short but the subject is vast", Yogaswami left the meeting immediately after understanding Vivekananda's words in an esoteric way. He had suddenly realised that the subject of God is immense whereas even an entire lifetime can be too short for God-realisation. Yogaswami's guru was a swami called Chellappa who wore dirty rags and lived by begging in the manner of a traditional sannyasin. Many regarded Chellappa as a curious mixture of extreme eccentricity and holiness because, among his other personal peculiarities, he pelted his admirers with stones and used obscene language. Only a few ardent devotees had the guts to go near him. It is not difficult to understand why Chellappa acquired a reputation as a mad man. But he was in fact a spiritually advanced soul. Chellappa put to the test Yogaswami's sincerity, sense of purpose and patience by subjecting him to rigorous trials. Both of them used to cook and eat together. Sometimes, just before eating, Chellappa used to dash to pieces the cooking pot containing the food. That was not all. In the scorching heat Chellappa would take out Yogaswami, promising him a refreshing bath, and after walking for miles they would return without having had a bath. In the immediate presence of Chellappa, his disciple Yogaswami had to practise spiritual austerities continuously for a period of forty days. Some of Chellappa's traits, as we shall see, rubbed off onto Yogaswami. As a wandering ascetic Yogaswami walked the length and breadth of the palm-fringed tropical island, visited many Sri Lankan temples and holy places, and eventually returned to Jaffna. He made a pilgrimage to India during the years 1934 to 1940. 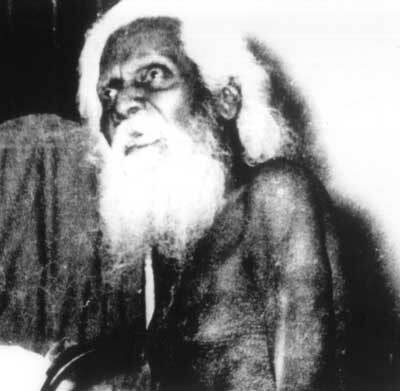 Once he visited the renowned saint of Tiruvannamalai --- Ramana Maharshi. Yogaswami remarked that he did not go to this sage with any desire but he simply went and stayed for about an hour in the presence of Ramana who did not speak at all. Yogaswami remarked that Ramana was a "great hero" (maha viran). The teachings of Yogaswami and Ramana have got a lot in common, especially the spiritual instruction "summa iru" which means "simply be", "let be" or "just be". It denotes the tranquil state of sahaja samadhi of an enlightened person --- the state of awareness that is choiceless and effortless. Translated differently, "summa iru" means "Be still!" To illustrate this instruction or teaching, both Yogaswami and Ramana were fond of quoting the Bible: "Be still, and know that I am God" (Psalms 46: 10). Oru pollappum illai : There is no evil at all, nothing is wrong. "Good" and "evil" are man-made distinctions. From the standpoint of the Absolute there is neither good nor bad. What we call "evil" is part of the Leela or play of the Lord. One cannot understand His ways or decisions. What one considers to be bad or objectionable may in fact have a Divine purpose and may even be a blessing in disguise. Muzhudum unmai: All is Truth (the whole thing is true). The sage who is fully realised sees the entire universe as a manifestation of God. He is not separate from the universe for He is Himself the universe. What we see as the created universe, the manifest and the unmanifest, are in fact, extensions of the Creator Himself. So the jivanmukta sees God in every tree, in every grain of sand, in every living creature and in every inanimate object. God is not separate from what He created. Nām Ariyom: We do not know. We know nothing. With our narrow conditioned minds we are incapable of knowing the Unborn, the Uncreated and the Unconditioned. Our minds are limited instruments that can only comprehend things of a mundane nature. But the mind cannot know God. Besides, we are incapable of understanding the ways of God.